Sometimes it’s important to know when someone finishes an assessment. Using standard, built-in Perception functionality you can have an automated email pushed to anyone you like–for instance the participant, a manager, or an instructor. But today I’d like to show how you can push an instant notification to an iPhone. Perception PIP files can be a powerful yet lightweight way to integrate with web applications. 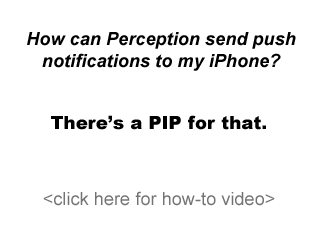 Using only a PIP file and a $2.99 iPhone application, you can send push notifications of assessment completion or results directly from Perception to your iPhone (actually up to 5 iPhones or iPod Touch devices at once). Interested to see it in action? Take a look at this 45 second video. It was surprisingly easy to do that with the help of the Perception Web Deployment Guide section on PIP files, and the Prowl API information. Of course, I also had to spend $2.99 to get Prowl on the iTunes App Store. If you’d like to learn how it is done, please take a quick look at the 5 minute explanation below. To make things still easier, the Questionmark documentation team added a Knowledge Base article to the Questionmark Support site, How can I use PIP and Prowl to send push notifications to my iPhone? (Community logon by Questionmark Software Support Plan customers required). I hope this inspires you to do your own creative PIP file integrations.